On March 14, 2005, a million and a half million Lebanese from all areas, communities, ages and political affiliations responded to a pro-Assad demonstration launched one week earlier by a Hezbollah gathering of more than 200,000 participants. The anti-Syrian occupation masses, much greater than any demonstration in the entire history of Lebanon were also larger than the entire body of partisans of all political parties combined which has never exceeded 200 to 300 hundred thousands at their best in 1989 and 1990. The 1.5 million people demonstrating on March 14, 2005 were the silent majority coming together on one day to achieve what all politicians had failed to achieve in the previous 15 years and what the warlords had tried to achieve in the 15 years of war. That is to push the Syrian occupation army out of Lebanon, in just one day. The political establishment had failed to stop Assad forces from entering the country in 1976, and had failed to pull it out throughout the war had it not been for raging battles in Beirut in 1978, and in Zahle in 1981. The political establishment also missed a earth shattering opportunity in 1982-1984 after Syrian and Israeli withdrawals from parts of the country. Lebanon was forced to experience an inexplicable internecine war in 1990 following a last campaign against the Syrian forces, all ending in chaos and in the fall of the last enclave. It took the efforts of grassroots inside Lebanon and the vision and focus of diaspora pressure groups to produce a UNSC resolution, unequal in international legal history. Even then, the politicians in charge weren't even planning an uprising. The people did the revolution, the political elite messed it up. The millions of Lebanese who hurried from the four corners of the country, from every single village, marched to downtown to finish off what no leaders have been able to shake off. The world heard and saw the first real Arab Spring in history, non violent, determined and diverse. A Cedars Revolution was born from the belly of the people. But the Cedars Revolution was supposed to continue after Martyrs Square to Baabda Palace, to Ain el Tine', to the Parliament and all institutions. The full revolution was supposed to crumble every trace of a dark past. The Army was supposed to march with the people, as Egypt has seen decades later. 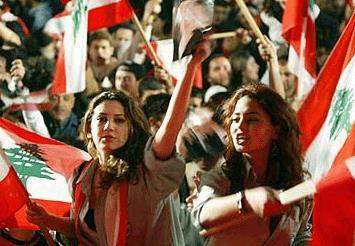 A new Lebanon was supposed to rise, free and sovereign. Instead politicians betrayed the revolution. They stopped the march, negotiated a new Government with Hezbollah, formed electoral coalitions with Hezbollah and invited the organization to join the Government. The rest is history as we know it. Failure after failure from 1005's assassinations, to the 2006 war, to the 2008 urban coup, to Doha and beyond. The real Cedars Revolution ended on March 14, 2005 at 6 PM. It lasted 12 not even 24 hours...But the remembrance remained, and the achievement of gathering the third of Lebanon's population in one place, was kept dear in the hearts of these young women and men who were the real heroes of the revolution. Almost as political orphans, the sons and daughters of the revolution are now ten years older. They look back in disbelieve and ask themselves. Was it worth the sacrifices. Yes it was. Did we achieve our goals, no we didn't. Are we masters of our destinies in Lebanon? No we aren't. Only another Cedars Revolution will finish what that generation has started. The future will tell.